The aggregate market value (approximate) of the registrant’s common equity held by non-affiliates based on the closing price of a share of the registrant’s common stock for New York Stock Exchange composite transactions on December 29, 2017 (the last business day of the registrant’s most recently completed second fiscal quarter) was $4,696,819,462. As of July 27, 2018, the total number of shares outstanding of the registrant’s Common Stock was 115,761,361 shares, net of treasury shares. Portions of the registrant’s definitive proxy statement (to be filed pursuant to Reg. 14A) relating to the Annual Meeting of Shareholders anticipated to be held on November 16, 2018, are incorporated herein by reference in Part III of this Report. Avnet, Inc. (the “Company” or “Avnet”), is a global technology solutions company with an extensive ecosystem delivering design, product, marketing and supply chain expertise for customers at every stage of the product lifecycle. Avnet transforms ideas into intelligent solutions, reducing the time, cost and complexities of bringing products to market around the world. Founded in 1921 and incorporated in New York in 1955, the Company works with over 1,400 technology suppliers to serve 2.1 million customers in more than 140 countries. For nearly a century, Avnet has helped its customers and suppliers realize the transformative possibilities of technology while continuously expanding the breadth and depth of its capabilities. Today, as technologies like the Internet of Things (“IoT”) continue to increase the complexity in product development, Avnet is once again redefining itself by offering everything customers need to bring their product to life through one partner. Most recently Avnet significantly enhanced its expertise in design, supply chain and logistics by acquiring the capabilities to better serve customers in the earlier stages of product development—encompassing research, prototyping and manufacturing—through the purchase of Premier Farnell (fiscal 2017), Hackster.io (fiscal 2017) and Dragon Innovation (fiscal 2018). Avnet’s ecosystem is designed to match its customers’ needs along their entire product development journey, providing both end-to-end and à la carte support options, as well as digital tools, to meet varying needs and buying preferences. The Company operates in 125 locations spanning the Americas, Europe, Middle East and Africa (“EMEA”) and Asia/Pacific (“Asia”) regions. Because Avnet supports every stage of the product lifecycle, it serves a wide range of customers: from startups and mid-sized businesses to enterprise-level original equipment manufacturers (“OEMs”), electronic manufacturing services (“EMS”) providers and original design manufacturers (“ODMs”). Avnet works with customers of every size, in every corner of the world, to guide today’s ideas into tomorrow’s technology. Avnet has two primary operating groups — Electronic Components (“EC”) and Premier Farnell (“PF”). Both operating groups have operations in each of the three major economic regions of the world: the Americas, EMEA and Asia. Each operating group has its own management team that includes senior executives and leadership both at the global and regional levels, who manage various functions within such businesses. Each operating group also has distinct financial reporting that is evaluated at the executive level on which operating decisions and strategic planning and resource allocation for the Company as a whole are made. Divisions (“business units”) exist within each operating group that serve primarily as sales and marketing units to further streamline the sales efforts within each operating group and enhance each operating group’s ability to work with its customers and suppliers, generally along more specific product lines or geographies. However, each business unit relies heavily on the support services provided by the operating groups as well as centralized support at the corporate level. A description of each operating group is presented below. Further financial information by operating group is provided in Note 17 “Segment information” to the consolidated financial statements appearing in Item 15 of this Annual Report on Form 10-K.
Avnet’s foreign operations are subject to a variety of risks. These risks are discussed further under Risk Factors in Item 1A and under Quantitative and Qualitative Disclosures About Market Risk in Item 7A of this Report. Additionally, the specific translation impacts of foreign currency fluctuations, most notably the Euro and the British Pound, on the Company’s consolidated financial statements are further discussed in Management’s Discussion and Analysis of Financial Condition and Results of Operations in Item 7 of this Report. Avnet’s EC operating group primarily supports high-volume customers. It markets, sells and provides value-added design and supply chain capabilities for semiconductors, electronic components (including interconnect, passive and electromechanical, or “IP&E,” devices) and other integrated components from the world’s leading electronic component manufacturers. EC serves a variety of markets ranging from automotive to medical to defense and aerospace. It offers an array of customer support options throughout the entire product lifecycle, including both turnkey and customized design, new product introduction, production, supply chain, logistics and post-sales services. EC offers design chain support that provides engineers with a host of technical design solutions, which help make it economically viable for EC’s suppliers to reach a customer segment that seeks complex products and technologies. With access to a suite of design tools and engineering support from any point in the design cycle, customers can get product specifications along with evaluation kits and reference designs that enable a broad range of applications from concept through detailed design including new product introduction. EC also offers engineering and technical resources deployed globally to support product design, bill of materials development, and technical education and training. By utilizing EC’s design chain support, customers can optimize their component selection and accelerate their time to market. EC’s extensive product line card provides customers access to a diverse range of products from a complete spectrum of electronic component manufacturers. EC’s supply chain solutions provide support and logistical services to OEMs, EMS providers and electronic component manufacturers, enabling them to optimize supply chains on a local, regional or global basis. By combining internal competencies in global warehousing and logistics, finance, information technology and asset management with its global footprint and extensive partner relationships, EC’s supply chain solutions provide for a deeper level of engagement with its customers. These customers can manage their supply chains to meet the demands of a competitive global environment without a commensurate investment in physical assets, systems and personnel. With supply chain planning tools and a variety of inventory management solutions, EC provides solutions that meet a customer’s just-in-time requirements and minimize risk in a variety of scenarios including lean manufacturing, demand flow and outsourcing. EC provides integrated solutions including technical design, integration and assembly of embedded products, systems and solutions primarily for industrial applications. EC also provides integrated solutions for intelligent embedded and innovative display solutions, including touch and passive displays. In addition, EC develops and produces standard board and industrial subsystems and application-specific devices that enable it to produce specialized systems tailored to specific customer requirements. EC serves OEMs that require embedded systems and solutions, including engineering, product prototyping, integration and other value-added services in the medical, telecommunications, industrial and digital editing markets. electronic components and industrial automation components to both engineers and entrepreneurs. PF brings the latest products, services and development trends all together in element14, an industry-leading online community where engineers collaborate to solve one another’s design challenges. In element14, members get consolidated information on new technologies as well as access to experts and products. Members can see what other engineers are working on, learn from online training and get the help they need to optimize their own designs. Avnet has historically pursued business acquisitions to further its strategic objectives and support key business initiatives, completing 100 acquisitions since 1991. This acquisition program was a significant factor in Avnet becoming one of the largest value-added distributors of electronic components including integrated products and solutions. Avnet expects to continue to pursue strategic acquisitions to expand its ecosystem, market presence, increase its scale and scope, and extend its product and service offerings throughout all stages of the technology product lifecycle. In fiscal 2017, the Company sold the Technology Solutions (“TS”) business, which was historically a reportable operating segment. With the sale of the TS business, the Company is focused on providing design and supply chain solutions specific to the electronic components industry. See Note 3 to the Company’s consolidated financial statements included in Item 15 of this Annual Report on Form 10-K for further discussion on the sale of the TS business. One of Avnet’s competitive strengths is the breadth and quality of the suppliers whose products it distributes. Texas Instruments products accounted for approximately 11% of the Company’s consolidated sales from continuing operations during fiscal 2018, 2017 and 2016, and was the only supplier from which sales of its products exceeded 10% of consolidated sales. Listed in the table below are the major product categories and the Company’s approximate sales of each during the past three fiscal years. Fiscal 2016 contained 53 weeks compared to 52 weeks in the other fiscal years presented. The electronic components industry continues to be extremely competitive. The Company’s major competitors include: Arrow Electronics, Inc., Future Electronics, World Peace Group, Mouser Electronics and Digi-Key Electronics. There are also certain smaller, specialized competitors who generally focus on narrower regions, markets, products or particular sectors. As a result of these factors, Avnet must remain competitive in its pricing of products. A key competitive factor in the electronic component distribution industry is the need to carry a sufficient amount of inventory to meet customers’ rapid delivery requirements. To minimize its exposure related to inventory on hand, the majority of the Company’s products are purchased pursuant to non-exclusive distributor agreements, which typically provide certain protections for product obsolescence and price erosion. These agreements are generally cancelable upon 30 to 180 days’ notice and, in most cases, provide for or require inventory return privileges upon cancellation. In fiscal 2017, certain suppliers terminated their distribution agreements with the Company, which did not result in any significant inventory write-downs as a result of such terminations. In addition, the Company enhances its competitive position by offering a variety of value-added services, which entail the performance of services and/or customer support tailored to individual customer specifications and business needs, such as point of use replenishment, testing, assembly, supply chain management and materials management. A competitive advantage is the breadth of the Company’s supplier product line card. Because of the number of Avnet’s suppliers, many customers can simplify their procurement process and make all of their required purchases from Avnet, rather than purchasing from several different distributors or other vendors. Historically, Avnet’s business and continuing operations has not been materially impacted by seasonality, with the exception of an impact on consolidated results from shifts in regional sales trends from Asia in the first half of a fiscal year to the Americas and EMEA regions in the second half of a fiscal year. At June 30, 2018, Avnet had approximately 15,400 employees compared to 15,700 employees at July 1, 2017, and 17,700 at July 2, 2016. The Company files its annual report on Form 10-K, quarterly reports on Form 10-Q, Current Reports on Form 8-K, proxy statements and other documents with the U.S. Securities and Exchange Commission (“SEC”) under the Securities Exchange Act of 1934. A copy of any document the Company files with the SEC is available for review at the SEC’s public reference room, 100 F Street, N.E., Washington, D.C. 20549. The public may obtain information on the public reference room by calling the SEC at 1-800-SEC-0330. The Company’s SEC filings are also available to the public on the SEC’s website at http://www.sec.gov and through The Nasdaq Global Select Market (“Nasdaq”), 165 Broadway, New York, New York 10006, on which the Company’s common stock is listed. The Company also makes these filings available, free of charge, through its website (see “Avnet Website” below). In addition to the information about the Company contained in this Report, extensive information about the Company can be found at http://www.avnet.com, including information about its management team, products and services and corporate governance practices. In addition, the Company’s Annual Report on Form 10-K, Quarterly Reports on Form 10-Q, Current Reports on Form 8-K and amendments to those reports, if any, filed or furnished pursuant to Section 13(a) or 15(d) of Securities Exchange Act of 1934, as well as Section 16 filings made by any of the Company’s executive officers or directors with respect to the Company’s common stock, are available on the Company’s website (http://www.avnet.com under the “Company — Investor Relations — SEC Filings” caption) as soon as reasonably practicable after the report is electronically filed with, or furnished to, the Securities and Exchange Commission. These details about the Company’s website and its content are only for information. The contents of the Company’s website are not, nor shall they be deemed to be, incorporated by reference in this Report. This Report contains forward-looking statements with respect to the financial condition, results of operations and business of Avnet. These statements are generally identified by words like “believes,” “plans,” “expects,” “anticipates,” “should,” “will,” “may,” “estimates” or similar expressions. Forward-looking statements are subject to numerous assumptions, risks and uncertainties. Except as required by law, Avnet does not undertake any obligation to update any forward-looking statements, whether as a result of new information, future events or otherwise. Factors that may cause actual results to differ materially from those contained in the forward-looking statements include those discussed below. The factors discussed below make the Company’s operating results for future periods difficult to predict and, therefore, prior results are not necessarily indicative of results to be expected in future periods. Any of the below factors, or any other factors discussed elsewhere in this Report, may have an adverse effect on the Company’s financial results, operations, prospects and liquidity. The Company’s operating results have fluctuated in the past and likely will continue to do so. If the Company’s operating results fall below its forecasts and the expectations of public market analysts and investors, the trading price of the Company’s common stock will likely decrease. Economic weakness and geopolitical uncertainty could adversely affect the Company’s results and prospects. to decreased sales or margins. The Company may not be able to adequately adjust its cost structure in a timely fashion, which may adversely impact its profitability. Uncertainty about economic conditions may increase foreign currency volatility in markets in which the Company transacts business, which may negatively impact the Company’s results. Economic weakness and geopolitical uncertainty also make it more difficult for the Company to manage inventory levels and/or collect customer receivables, which may result in provisions to create reserves, write-offs, reduced access to liquidity and higher financing costs. The Company experiences significant competitive pressure, which may negatively impact its results. The market for the Company’s products and services is very competitive and subject to rapid technological advances, new market entrants, non-traditional competitors, changes in industry standards and changes in customer needs and consumption models. Not only does the Company compete with other global distributors, it also competes for customers with regional distributors and some of the Company’s own suppliers that maintain direct sales efforts. In addition, as the Company expands its offerings and geographies, the Company may encounter increased competition from current or new competitors. The Company’s failure to maintain and enhance its competitive position could adversely affect its business and prospects. Furthermore, the Company’s efforts to compete in the marketplace could cause deterioration of gross profit margins and, thus, overall profitability. The size of the Company’s competitors vary across market sectors, as do the resources the Company has allocated to the sectors and geographic areas in which it does business. Therefore, some competitors may have greater resources or a more extensive customer or supplier base than the Company has in one or more of its market sectors and geographic areas, which may result in the Company not being able to effectively compete in certain markets which could impact the Company’s profitability and prospects. Changes in customer needs and consumption models could significantly affect the Company’s operating results. Changes in customer needs and consumption models may cause a decline in the Company’s billings, which would have a negative impact on the Company’s financial results. While the Company attempts to identify changes in market conditions as soon as possible, the dynamics of these industries make prediction of, and timely reaction to such changes difficult. Future downturns in the semiconductor and embedded solutions industries could adversely affect the Company’s operating results and negatively impact the Company’s ability to maintain its current profitability levels. In addition, the semiconductor industry has historically experienced periodic fluctuations in product supply and demand, often associated with changes in economic conditions, technology and manufacturing capacity. During fiscal years 2018, 2017, and 2016, sales of semiconductors represented approximately 78%, 78%, and 83% of the Company's consolidated sales, respectively, and the Company’s sales closely follow the strength or weakness of the semiconductor industry. Due to the Company’s increased online sales, system interruptions and delays that make its websites and services unavailable or slow to respond may reduce the attractiveness of its products and services to its customers. If the Company is unable to continually improve the efficiency of its systems, it could cause systems interruptions or delays and adversely affect the Company’s operating results. Failure to maintain or develop new relationships with key suppliers could adversely affect the Company’s sales. Company in the future, because of a product shortage, an unwillingness to do business with the Company, changes in strategy or otherwise, the Company’s business and relationships with its customers could be negatively affected because its customers depend on the Company’s distribution of technology hardware and software from the industry’s leading suppliers. In addition, suppliers’ strategy shifts or performance issues may negatively affect the Company’s financial results. The competitive landscape has also experienced a consolidation among suppliers, which could negatively impact the Company’s profitability and customer base. Further, to the extent that any of the Company’s key suppliers modify the terms of their contracts including, without limitation, the terms regarding price protection, rights of return, rebates or other terms that protect or enhance the Company’s gross margins, it could negatively affect the Company’s results of operations, financial condition or liquidity. The Company’s non-U.S. locations represent a significant portion of its sales and, consequently, the Company is exposed to risks associated with operating internationally that could adversely affect the Company’s operating results. the risk of non-compliance with local laws. the Company has adopted measures and controls designed to ensure compliance with these laws, the Company cannot be assured that such measures will be adequate or that its business will not be materially and adversely impacted in the event of an alleged violation. The Company transacts sales, pays expenses, owns assets and incurs liabilities in countries using currencies other than the U.S. Dollar. Because the Company’s consolidated financial statements are presented in U.S. Dollars, the Company must translate sales, income and expenses, as well as assets and liabilities, into U.S. Dollars at exchange rates in effect during each reporting period. Therefore, increases or decreases in the exchange rates between the U.S. Dollar and other currencies affect the Company’s reported amounts of sales, operating income, assets and liabilities denominated in foreign currencies. In addition, unexpected and dramatic changes in foreign currency exchange rates may negatively affect the Company’s earnings from those markets. While the Company may use derivative financial instruments to further reduce its net exposure to foreign currency exchange rate fluctuations, there can be no assurance that fluctuations in foreign currency exchange rates will not materially affect the Company’s financial results. Further, foreign currency instability and disruptions in the credit and capital markets may increase credit risks for some of the Company’s customers and may impair its customers’ ability to repay existing obligations. Recently, the U.S. government imposed new or higher tariffs on certain products imported into the U.S., which have increased the costs of procuring certain products the Company purchases from its suppliers. The higher tariffs, along with any additional tariffs or trade restrictions that may be implemented by the U.S. or by other countries on U.S. goods in the future, may result in further increased costs and other related expenses. While the Company intends to reflect such increased costs in its selling prices, such price increases may impact the Company’s sales and customer demand for certain products. In addition, increased operational expenses incurred in minimizing the number of products subject to the tariffs could adversely affect the operating profits for certain of its business units. Neither such U.S. tariffs nor any retaliatory tariffs imposed by other countries on U.S. goods have yet had a significant impact, but there can be no assurance that future actions or escalations that affect trade relations will not occur or will not materially affect the Company’s sales and results of operations. To the extent that Company sales or profitability are negatively affected by any such tariffs or other trade actions, the Company’s business and results of operations may be materially adversely affected. If the Company’s internal information systems fail to function properly, or if the Company is unsuccessful in the implementation, integration or upgrade of information systems, its business operations could suffer. The Company is dependent on its information systems to facilitate the day-to-day operations of the business and to produce timely, accurate and reliable information on financial and operational results. Currently, the Company’s global operations are tracked with multiple information systems, some of which are subject to ongoing IT projects designed to streamline or optimize the Company’s global information systems. These IT projects are extremely complex, in part, because of a wide range of processes, the multiple legacy systems used and the Company’s business operations. There is no guarantee that the Company will be successful at all times in these efforts or that there will not be implementation or integration difficulties that will adversely affect the Company’s ability to complete business transactions and ensure accurate recording and reporting of financial data. In addition, the Company may be unable to achieve the expected efficiencies and cost savings as a result of the IT projects, thus negatively impacting the Company’s financial results. A failure of any of these information systems in a way described above or material difficulties in upgrading these information systems could have an adverse effect on the Company’s business, internal controls and reporting obligations under federal securities laws. The Company’s acquisition strategy may not produce the expected benefits, which may adversely affect the Company’s results of operations. and uncertainties, some of which may differ from those associated with Avnet’s historical operations. The risks relating to such acquisitions and investments include, but are not limited to, risks relating to expanding into emerging markets and business areas, adding additional product lines and services, impacting existing customer and supplier relationships, incurring costs or liabilities associated with the companies acquired, incurring potential impairment charges on acquired goodwill and other intangible assets and diverting management’s attention from existing business operations. As a result, the Company’s profitability may be negatively impacted. In addition, the Company may not be successful in integrating the acquired businesses or the integration may be more difficult, costly or time-consuming than anticipated. Further, any litigation relating to a potential acquisition will result in an increase in the expenses associated with the acquisition or cause a delay in completing the acquisition, thereby impacting the Company’s profitability. The Company may experience disruptions that could, depending on the size of the acquisition, have an adverse effect on its business, especially where an acquisition target may have pre-existing compliance issues or pre-existing deficiencies or material weaknesses in internal controls over financial reporting. Furthermore, the Company may not realize all of the anticipated benefits from its acquisitions, which could adversely affect the Company’s financial performance. Major disruptions to the Company’s logistics capability could have an adverse impact on the Company’s operations. The Company’s global logistics services are operated through specialized, centralized or outsourced distribution centers around the globe. The Company also depends almost entirely on third-party transportation service providers for the delivery of products to its customers. A major interruption or disruption in service at one or more of its distribution centers for any reason (such as information technology upgrades and operating issues, warehouse modernization and relocation efforts, natural disasters, pandemics, or significant disruptions of services from the Company’s third-party transportation providers) could cause cancellations or delays in a significant number of shipments to customers and, as a result, could have an adverse impact on the Company’s business partners, and on the Company’s business, operations and financial performance. If the Company sustains cyber-attacks or other privacy or data security incidents that result in security breaches, it could suffer a loss of sales and increased costs, exposure to significant liability, reputational harm and other negative consequences. The Company’s information technology may be subject to cyber-attacks, security breaches or computer hacking. Experienced computer programmers and hackers may be able to penetrate the Company’s security controls and misappropriate or compromise sensitive personal, proprietary or confidential information, create system disruptions or cause shutdowns. They also may be able to develop and deploy malicious software programs that attack the Company’s systems or otherwise exploit any security vulnerabilities. The Company’s systems and the data stored on those systems may also be vulnerable to security incidents or security attacks, acts of vandalism or theft, coordinated attacks by activist entities, misplaced or lost data, human errors, or other similar events that could negatively affect the Company’s systems and its data, as well as the data of the Company’s business partners. Further, third parties, such as hosted solution providers, that provide services to the Company, could also be a source of security risk in the event of a failure of their own security systems and infrastructure. and the Company may suffer losses that could have a material adverse effect on its business. As a global enterprise, the Company could also be negatively impacted by existing and proposed laws and regulations, as well as government policies and practices related to cybersecurity, data privacy, data localization and data protection. Declines in the value of the Company’s inventory or unexpected order cancellations by the Company’s customers could adversely affect its business, results of operations, financial condition and liquidity. The electronic components and integrated products industries are subject to rapid technological change, new and enhanced products, changes in customer needs and changes in industry standards and regulatory requirements, which can contribute to a decline in value or obsolescence of inventory. Regardless of the general economic environment, it is possible that prices will decline due to a decrease in demand or an oversupply of products and, as a result of the price declines, there may be greater risk of declines in inventory value. Although it is the policy of many of the Company’s suppliers to offer certain protections from the loss in value of inventory (such as price protection and limited rights of return), the Company cannot be assured that such policies will fully compensate for the loss in value, or that the suppliers will choose to, or be able to, honor such agreements, some of which are not documented and, therefore, subject to the discretion of the supplier. In addition, the majority of the Company’s sales are made pursuant to individual purchase orders, rather than through long-term sales contracts. Where there is a contract, such contract is generally terminable at will upon notice. The Company cannot be assured that unforeseen new product developments, declines in the value of the Company’s inventory or unforeseen order cancellations by its customers will not adversely affect the Company’s business, results of operations, financial condition or liquidity. Substantial defaults by the Company’s customers or suppliers on its accounts receivable or the loss of significant customers could have a significant negative impact on the Company’s business, results of operations, financial condition or liquidity. A significant portion of the Company’s working capital consists of accounts receivable. If entities responsible for a significant amount of accounts receivable were to cease doing business, direct their business elsewhere, become insolvent or unable to pay the amount they owe the Company, or were to become unwilling or unable to make such payments in a timely manner, the Company’s business, results of operations, financial condition or liquidity could be adversely affected. An economic or industry downturn could adversely affect the collectability of these accounts receivable, which could result in longer payment cycles, increased collection costs and defaults in excess of management’s expectations. A significant deterioration in the Company’s ability to collect on accounts receivable in the United States could also impact the cost or availability of financing under its accounts receivable securitization program. The Company may not have adequate or cost-effective liquidity or capital resources which could adversely affect the Company’s operations. The Company’s ability to satisfy its cash needs and implement its capital allocation strategy depends on its ability to generate cash from operations and to access the financial markets, both of which are subject to general economic, financial, competitive, legislative, regulatory and other factors that are beyond the Company’s control. The Company may need to satisfy its cash needs through external financing. However, external financing may not be available on acceptable terms or at all. As of June 30, 2018, Avnet had total debt outstanding of approximately $1.65 billion under various notes, secured borrowings and committed and uncommitted lines of credit with financial institutions. The Company needs cash to make interest payments on, and to repay, this indebtedness and for general corporate purposes, such as funding its ongoing working capital and capital expenditure needs. Under the terms of any external financing, the Company may incur higher than expected financing expenses and become subject to additional restrictions and covenants. Any material increase in the Company’s financing costs could have an adverse effect on its profitability. Under certain of its credit facilities, the Company is required to maintain certain specified financial ratios and pass certain financial tests. If the Company fails to meet these financial ratios and/or pass these tests, it may be unable to continue to utilize these facilities. If the Company is unable to utilize these facilities, it may not have sufficient cash available to make interest payments, to repay indebtedness or for general corporate needs. General economic or business conditions, domestic and foreign, may be less favorable than management expects and could adversely impact the Company’s sales or its ability to collect receivables from its customers, which may impact access to the Company’s accounts receivable securitization program. In order to be successful, the Company must attract, retain, train, motivate and develop key employees, and failure to do so could adversely impact the Company’s results and strategic initiatives. Identifying, developing internally or hiring externally, training and retaining qualified employees are critical to the Company’s future, and competition for experienced employees in the Company’s industry can be intense. Changing demographics and labor work force trends may result in a loss of knowledge and skills as experienced workers leave the Company. In addition, as global opportunities and industry demand shifts, and as the Company expands its offerings, realignment, training and hiring of skilled personnel may not be sufficiently rapid. From time to time the Company has effected restructurings, which eliminate a number of positions. Even if such personnel are not directly affected by the restructuring effort, such terminations can have a negative impact on morale and the Company’s ability to attract and hire new qualified personnel in the future. If the Company loses existing qualified personnel or is unable to hire new qualified personnel, as needed, the Company’s business, financial condition and results of operations could be seriously harmed. The agreements governing some of the Company’s financings contain various covenants and restrictions that limit management’s discretion in operating the business and could prevent management from engaging in some activities that may be beneficial to the Company’s business. engage in certain transactions with affiliates. As a result of these covenants and restrictions, the Company may be limited in the future in how it conducts its business and may be unable to raise additional debt, repurchase common stock, pay a dividend, compete effectively or make further investments. The Company may become involved in legal proceedings that could cause it to incur substantial costs, divert management’s efforts or require it to pay substantial damages or licensing fees. diversion of management’s efforts and other resources and could have an adverse effect on the Company’s operations. Further, the Company may be obligated to indemnify and defend its customers if the products or services the Company sells are alleged to infringe any third party’s intellectual property rights. While the Company may be able to seek indemnification from its suppliers for itself and its customers against such claims, there is no assurance that it will be successful in realizing such indemnification or that the Company will be fully protected against such claims. In addition, the Company is exposed to potential liability for technology that it develops for which it has no indemnification protections. If an infringement claim against the Company is successful, the Company may be required to pay damages or seek royalty or license arrangements, which may not be available on commercially reasonable terms. The Company may have to stop selling certain products or services, which could affect its ability to compete effectively. Changes in tax rules and regulations, changes in interpretation of tax rules and regulations, changes in business performance or unfavorable assessments from tax audits could adversely affect the Company’s effective tax rates, deferred taxes, financial condition and results of operations. As a multinational corporation, the Company is subject to the tax laws and regulations of the United States and many foreign jurisdictions. From time to time, regulations may be enacted that could adversely affect the Company’s tax positions. There can be no assurance that the Company’s cash flow, and in some cases the effective tax rate, will not be adversely affected by these potential changes in regulations or by changes in the interpretation of existing tax law and regulations. On December 22, 2017, the U.S. federal government enacted tax legislation (the “Tax Cuts and Jobs Act” or the “Act”) which includes provisions to lower the corporate income tax rate, impose new taxes on certain foreign earnings, limit deductibility of certain U.S. costs and levy a one-time deemed repatriation tax on accumulated offshore earnings, among others. The Act is subject to interpretation and implementation guidance by both federal and state tax authorities, as well as amendments and technical corrections. Any or all of these could impact the Company unfavorably. Many countries are adopting provisions to align their international tax rules with the Base Erosion and Profit Shifting Project, led by the Organisation for Economic Co-operation and Development, to standardize and modernize global corporate tax policy. These provisions, individually or as a whole, may negatively impact taxation of international business. The tax laws and regulations of the various countries where the Company has operations are extremely complex and subject to varying interpretations. Although the Company believes that its historical tax positions are sound and consistent with applicable laws, regulations and existing precedent, there can be no assurance that these tax positions will not be challenged by relevant tax authorities or that the Company would be successful in defending against any such challenge. The Company’s future income tax expense could also be favorably or adversely affected by changes in the mix of earnings in countries with differing statutory tax rates, changes in the valuation of deferred tax assets and liabilities and changes to its operating structure. If the Company fails to maintain effective internal controls, it may not be able to report its financial results accurately or timely, or prevent or detect fraud, which could have an adverse effect on the Company’s business or the market price of the Company’s securities. to maintain the adequacy of its internal controls, including any failure to implement required new or improved internal controls, or if the Company experiences difficulties in their implementation, the Company’s business and operating results could be harmed. Additionally, the Company may be subject to sanctions or investigations by regulatory authorities, and the Company could fail to meet its reporting obligations, all of which could have an adverse effect on its business or the market price of the Company’s securities. Failure to comply with the requirements of environmental regulations could adversely affect the Company’s business. The Company is subject to various federal, state, local and foreign laws and regulations addressing environmental and other impacts from product disposal, use of hazardous materials in products, recycling of products at the end of their useful life and other related matters. While the Company strives to ensure it is in full compliance with all applicable regulations, certain of these regulations impose liability without fault. Additionally, the Company may be held responsible for the prior activities of an entity it acquired. Failure to comply with these regulations could result in substantial costs, fines and civil or criminal sanctions, as well as third-party claims for property damage or personal injury. Further, environmental laws may become more stringent over time, imposing greater compliance costs and increasing risks and penalties associated with violations. As a result primarily of certain former manufacturing operations, Avnet has incurred and may have future liability under various federal, state and local environmental laws and regulations, including those governing pollution and exposure to, and the handling, storage and disposal of, hazardous substances. For example, under the Comprehensive Environmental Response, Compensation and Liability Act of 1980, as amended (“CERCLA”) and similar state laws, Avnet is and may be liable for the costs of cleaning up environmental contamination on or from certain of its current or former properties, and at off-site locations where the Company disposed of wastes in the past. Such laws may impose joint and several liability. Typically, however, the costs for clean up at such sites are allocated among potentially responsible parties based upon each party’s relative contribution to the contamination, and other factors. concluded that no particular pending legal proceeding requires public disclosure. Based on the information known to date, management believes that the Company has appropriately accrued in its consolidated financial statements for its share of the estimable costs of environmental and other compliance related matters. The Company is also currently subject to various pending and potential legal matters and investigations relating to compliance with governmental laws and regulations, including import/export and environmental matters. The Company currently believes that the resolution of such matters will not have a material adverse effect on the Company’s financial position or liquidity, but could possibly be material to its results of operations in any one reporting period. The declaration and payment of future dividends will be at the discretion of the Board of Directors and will be dependent upon the Company’s financial condition, results of operations, capital requirements, and other factors the Board of Directors considers relevant. In addition, certain of the Company’s debt facilities may restrict the declaration and payment of dividends, depending upon the Company’s then current compliance with certain covenants. As of July 27, 2018, there were 1,837 registered holders of record of Avnet’s common stock. Includes 2,321,787 shares subject to options outstanding, 1,036,160 restricted stock units and 440,327 performance share units awarded but not yet vested as of the end of the fiscal year. Does not include 97,487 shares available for future issuance under the Employee Stock Purchase Plan, which is a non-compensatory plan. 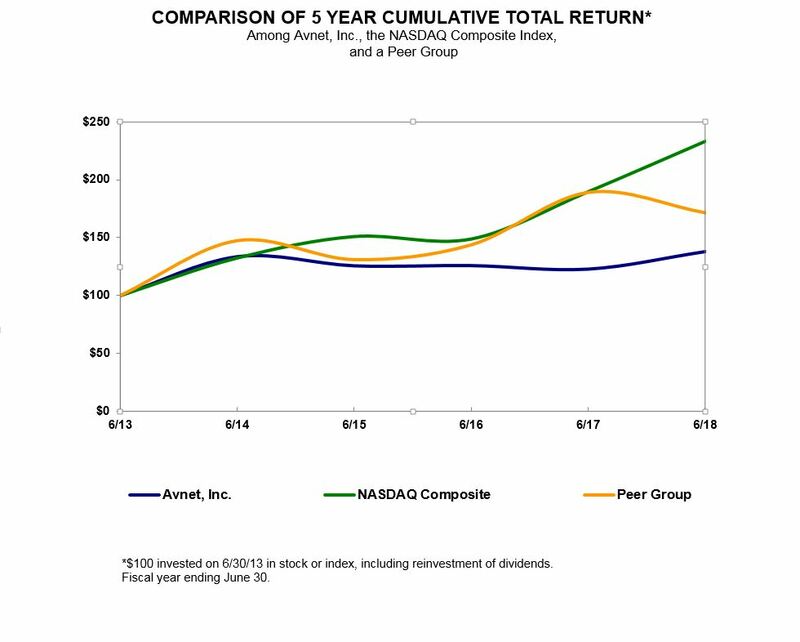 The graph below matches the cumulative 5-year total return of holders of Avnet’s common stock with the cumulative total returns of the Nasdaq Composite index and a customized peer group of seven companies that includes: Agilysys Inc., Anixter International Inc., Arrow Electronics Inc., Insight Enterprises Inc., Scansource Inc., Synnex Corp and Tech Data Corp. The graph assumes that the value of the investment in Avnet’s common stock, in each index, and in the peer group (including reinvestment of dividends) was $100 on 6/30/2013 and tracks it through 6/30/2018. The following selected financial data has been derived from the Company’s consolidated financial statements. The data set forth below should be read in conjunction with Management’s Discussion and Analysis of Financial Condition and Results of Operations and the consolidated financial statements and notes thereto. In February 2017, the Company completed the sale of its TS business and as such, the results of that business are classified as discontinued operations in all periods presented. Fiscal 2016 contained 53 weeks compared to 52 weeks in the other fiscal years presented. All fiscal years presented include restructuring, integration and other expenses, which totaled $145.1 million in fiscal 2018, $137.4 million in fiscal 2017, $44.8 million in fiscal 2016, $41.8 million in fiscal 2015, and $66.8 million in fiscal 2014. All fiscal years presented include amortization of acquired intangible assets and other, which totaled $91.9 million in fiscal 2018, $54.5 million in fiscal 2017, $9.8 million in fiscal 2016, $18.1 million in fiscal 2015, and $17.7 million in fiscal 2014. Certain fiscal years presented were impacted by expense or income amounts that impact the comparability between years including a goodwill impairment expense of $181.4 million and a one-time mandatory deemed repatriation tax liability of $230.0 million in fiscal 2018, a gain on disposal of the TS business of $222.4 million after tax in fiscal 2017, and a gain on legal settlement of $13.5 million after tax in fiscal 2014. This calculation of working capital is defined as current assets less current liabilities. See the “Liquidity” section contained in Item 7 of this Annual Report on Form 10-K for further discussion on liquidity. Quarters may not total to the fiscal year due to rounding. First quarter of fiscal 2018 net income was impacted by restructuring, integration and other expenses of $29.6 million after tax, foreign currency gain and other expense of $6.5 million after tax and a discrete income tax benefit of $6.9 million. Second quarter results were impacted by restructuring, integration and other expenses of $27.8 million after tax and a discrete income tax benefit of $8.0 million. Third quarter results were impacted by restructuring, integration and other expenses of $19.4 million after tax, a goodwill impairment of $181.4 million and a discrete income tax expense of $218.8 million. Fourth quarter results were impacted by restructuring, integration and other expenses of $26.9 million after tax and a discrete income tax expense of $14.5 million. First quarter of fiscal 2017 net income was impacted by restructuring, integration and other expenses of $20.2 million after tax and a discrete income tax benefit of $1.4 million. Second quarter results were impacted by restructuring, integration and other expenses of $23.0 million after tax and a discrete income tax expense of $9.4 million. Third quarter results were impacted by restructuring, integration and other expenses of $23.1 million after tax, the gain on sale of the TS business of $217.1 million after tax, a gain on marketable securities of $8.4 million after tax and a discrete income tax benefit of $7.7 million. Fourth quarter results were impacted by restructuring, integration and other expenses of $25.7 million after tax, a loss on a marketable securities hedge of $7.8 million after tax, and a discrete income tax benefit of $15.0 million. For an understanding of Avnet and the significant factors that influenced the Company’s performance during the past three fiscal years, the following discussion should be read in conjunction with the description of the business appearing in Item 1 of this Report and the consolidated financial statements, including the related notes and schedule, and other information appearing in Item 15 of this Report. The Company operates on a “52/53 week” fiscal year. Fiscal 2018 and 2017 both contained 52 weeks, and fiscal 2016 contained 53 weeks. The extra week impacts the year-over-year analysis of fiscal 2016 compared to fiscal 2018 and fiscal 2017 in this MD&A. Operating income excluding (i) restructuring, integration and other expenses (see Restructuring, Integration and Other Expenses in this MD&A), (ii) goodwill impairment expense and (iii) amortization of acquired intangible assets and other is referred to as “adjusted operating income.” Adjusted operating income excludes the TS business, which is reported within discontinued operations for all periods presented. Management believes that providing this additional information is useful to readers to better assess and understand operating performance, especially when comparing results with prior periods or forecasting performance for future periods, primarily because management typically monitors the business both including and excluding these adjustments to GAAP results. Management also uses these non-GAAP measures to establish operational goals and, in many cases, for measuring performance for compensation purposes. However, any analysis of results on a non-GAAP basis should be used as a complement to, and in conjunction with, results presented in accordance with GAAP. Sales for fiscal 2018 were $19.04 billion, an increase of 9.2% from fiscal 2017 sales of $17.44 billion primarily due to the acquisition of PF and the impact of foreign currency exchange rates, partially offset by certain supplier channel and program changes. EC sales in fiscal 2018 were $17.5 billion, representing a 6.5% increase over fiscal 2017 as sales growth in the EMEA and Asia regions offset declines in the Americas region. Organic sales in constant currency increased 3.6% year over year with both the EC and PF operating groups contributing to this increase. Gross profit in fiscal 2018 was $2.53 billion, an increase of $157.7 million, or 6.7%, compared to fiscal 2017. This increase was primarily due to the acquisition of PF and the impact of changes in foreign currency exchange rates, partially offset by certain supplier channel and program changes. Operating income margin was 1.2% in fiscal 2018 and 2.6% in fiscal 2017. Both periods included amortization and restructuring, integration and other expenses. Fiscal 2018 also includes goodwill impairment expense. Excluding these expenses, adjusted operating income margin was 3.4% and 3.7% in fiscal 2018 and fiscal 2017, respectively. The table below provides a year-over-year summary of sales for the Company and its operating groups. During October of fiscal 2017, the Company acquired PF. The table below provides a comparison of reported and organic sales for fiscal 2018 to fiscal 2017 sales to allow readers to better assess and understand the Company’s sales performance by operating group on a more comparable basis. Includes PF acquired on October 17, 2016, which has operations in each Avnet region. Avnet’s sales for fiscal 2018 were $19.04 billion, up $1.6 billion, or 9.2%, from fiscal 2017 sales of $17.44 billion. The sales growth was primarily driven by the acquisition of PF and the impact of changes in foreign currency exchange rates as approximately $575 million of the increase in sales was attributable to the translation impact of changes in foreign currency exchange rates, primarily in EMEA. These increases in sales were partially offset by the impact of supplier channel and program changes, which occurred during fiscal 2017 into the first half of fiscal 2018. On an organic basis and in constant currency, consolidated sales increased 3.6% with both operating groups contributing to the increase. EC sales in fiscal 2018 were $17.5 billion, representing a 6.5% increase over fiscal 2017 sales. On an organic basis in constant currency, EC sales increased 3.4% year-over-year as sales growth in the EMEA and Asia regions offset a 6.7% decline in the Americas region resulting primarily from supplier channel and program changes. Sales in the EMEA and Asia regions increased in constant currency 2.0% and 12.5%, respectively, which was primarily driven by strong demand across many product verticals, partially offset by declines from supplier channel and program changes. PF sales in fiscal 2018 increased on an organic basis 11.1% and 6.5% in constant currency with all three geographic regions contributing to the increase. The organic increase in each of the three regions is primarily due to the expansion of the PF line-card and an investment in inventory to achieve a broader portfolio of products. The table below provides the comparison of reported and organic fiscal 2017 sales to fiscal 2016 sales to allow readers to better assess and understand the Company’s sales performance.